Shadow, Fang, Feather and Leaf Clan! Four new clans join the battle in Crystal Clans! Hello, Crystal Clans fans! As word of the crystals and their powers spread, more clans have emerged to do battle and claim them! Plaid Hat Games is pleased to announce the coming of four new expansions for Crystal Clans! Each expansion contains a brand-new, fully playable clan to add to your collection and send against your opponents. The Shadow, Fang, Leaf and Feather Clans each contain new and unique play styles as well as units to lead that clan to victory! We will be releasing new preview articles on each clan in the future, but for now let's take a quick look at each one! The Shadow Clan excels at stealth and manipulation. Their signature Shadow Step ability allows Shadow units to move to an enemy zone for 1 initiative, letting them lash out with surprise attacks where the enemy is weakest. Other abilities like Sneak Attack and Gather Intel let them continue to manipulate their foes and gain the advantage. The Shadow Clan proves that a blade in hiding is worth more than the strength of an army, when applied to the right place. You can preorder the Shadow Clan here. The Fang Clan are as ferocious as they are strong, and it takes a formidable leader to channel their raw power on the battlefield. Their signature Alpha ability means the fiercest units in your squad will always fight to be on top, but be careful, as sometimes these units can be the hardest to control. With abilities like Rabid and Out for Blood, the Fang Clan proves that the best defense is often a strong offense, and the best offense is often a pack of ravenous, armored wolves. You can preorder the Fang Clan here. You can preorder the Leaf Clan here. The Feather Clan soar above the battlefield and swoop down to meet their enemy. Like other clans, several units in the Feather Clan have the Flying unit type. But unlike other clans, Feather Clan units have access to the Soar signature ability, which allows a squad of all-flying units to move 3 spaces instead of 2, and move out of zones that contain enemy units. This gives the Feather Clan an unprecedented level of mobility on the battlefield, and with abilities like Volley and Target, they promise to use this mobility to launch devastating strikes against their opponent. The units of the Feather Clan will own the sky and destroy any who stand in their way. You can preorder the Feather Clan here. These four new clans will be making their way to retailers and our own web store in July, and we'll soon have a special bundled preorder for fans to order all of the expansions together! Stay tuned for more previews on all four clans! Also, the third scenario for Crystal Clans, using the clans in the base game, is available now! The Blood and Stone Clans square off in a battle to control the battlefield, but it looks like someone went and fed Big a crystal! The Blood Clan has obtained an especially powerful crystal, called Epoch’s Revival. They have fed it to Big. The result? 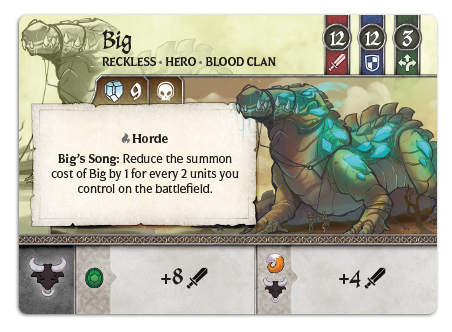 Big has become easier to summon, constantly returns from the dead, and can easily destroy the Stone Clan if it can eat enough of them. The Blood Clan has launched an all-out attack to achieve this. If they can get Big to eat enough of the Stone Clan's units, they should be able to satiate Big's hunger for now (before he decides to eat any Blood Clan units, that is). But if the Stone Clan can gather enough of the Crystals, they should be able to undo the power of Epoch's Revival. You can download "Sing a Song of Big" here. That's all for now! Be sure to check back as we begin previews of the upcoming Clans next week, and don't forget to check out the Crystal Clans Unit Browser for our expanding lore on the units of Crystal Clans. Also, Scenario 1 and Scenario 2 are also available now for download. Enjoy!